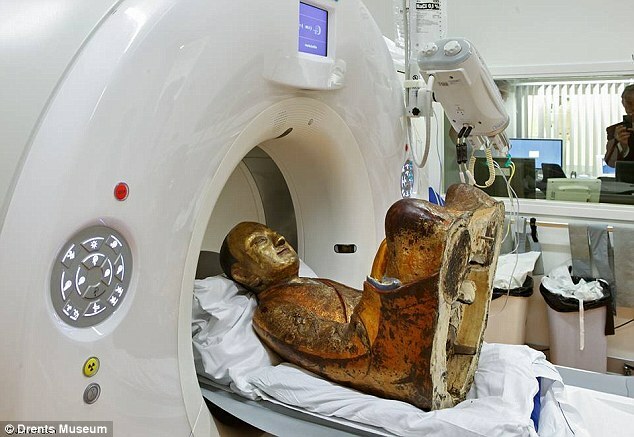 Researchers at a museum in the Netherlands were shocked to learn a certain Buddha statue’s secret: the 1,000-year-old mummified remains of a monk sitting inside it. Imaging initially revealed a human skeleton behind the cast. Sitting in a lotus position, the corpse fits the statue’s dimensions perfectly. 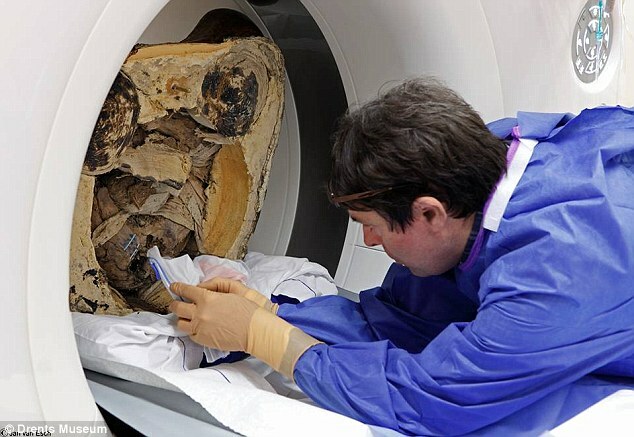 Through additional examination, via and endoscopy and supplementary CT scans performed at the Meander Medical Center in Amersfoort, the mummy was discovered to have had its internal organs removed. In their place are scripts covered in messages written in Chinese. 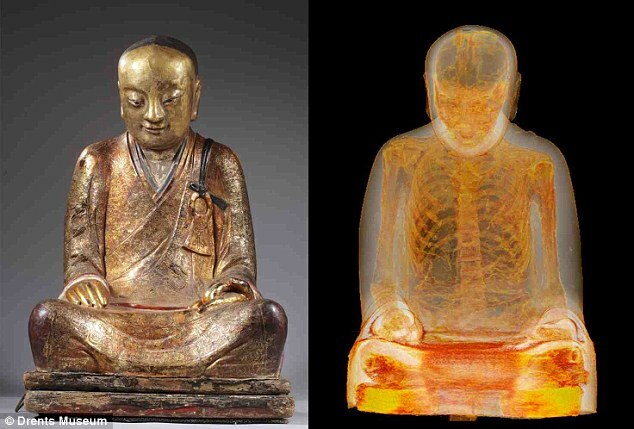 While it was known before the scan that a mummy was inside the statue, it wasn’t until then that researchers discovered that the monk’s organs had been removed from his body, according to Colossal. Many practicing Buddhists believe that mummies like that of Buddhist master Liuquan aren’t actually dead, but are rather in an advanced state of meditation, according to International Business Times. Self-mummification was a practice that involved a strict diet, poison, and inhuman levels of self-control. “In China, and also in Japan and Laos and Korea, there’s a tradition of self-mummification,” said Vincent van Vilsteren, the museum’s archaeology curator. The process began with a diet that would make even the most disciplined super model weep. For 1,000 days, the monk was restricted to eating only nuts and seeds. This was followed by another 1,000 days of eating roots and bark. This ensured the body would be rid of any traces of fat. Once this phase was over, the monk then had to ingest a special kind of tea, which was really a toxic concoction made from Japanese varnish tree sap – a substance ordinarily used as lacquer for plates and bowls. The beverage induced severe vomiting and bodily fluid loss. This step possibly made the body so poisonous that insects and bacteria were unable to feed on it, therefore discouraging its decomposition. The emaciated monk was then moved into a cramped stone tomb in which he would sit in the lotus position. The tomb was fitted with a tube that gave him access to air, and a bell which he would ring each day to signal to those outside that he hadn’t expired yet. Upon death, his cohorts removed the tube and sealed the tomb. The tomb would be reopened after 1,000 days to reveal either a successfully mummified monk, or an ordinary corpse. In fact, only a handful out of hundreds of attempts at self-mummification produced mummies fit to be placed in temples for worship as Buddhas. While the remains weren’t intensively analyzed until late last year, they were actually discovered by preservationists many years ago. Coated in gold paint and laquer, the papier-mache Buddha could have been smuggled from a monastery in Southeastern China during the Cultural Revolution. Eventually, it found its way to the Netherlands, where, in 1996, its private owner commissioned for it to be restored. Upon lifting the Buddha from its wooden platform, however, the restorer was surprised to find a rolled-up textile carpet, inscribed with Chinese writing, beneath its knees. Removing the pillows revealed the mummy. Using radioactive carbon isotopes, the mummy was dated to the 11th or 12th century. The carpet was determined to be 200 years older. The Buddha statue finds its temporary home at the National Museum of Natural History in Budapest.